← Chris Economaki 1920-2012 R.I.P. 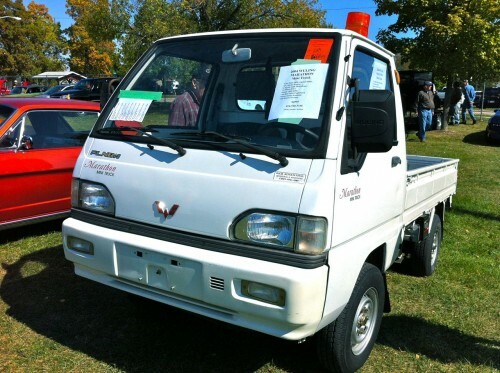 Last spring’s Jefferson (Wis.) car show had its share of automotive oddities such as the Aussie Ford Falcon and the 1982 Chrysler Imperial Frank Sinatra edition but the fall show topped those by a country mile. 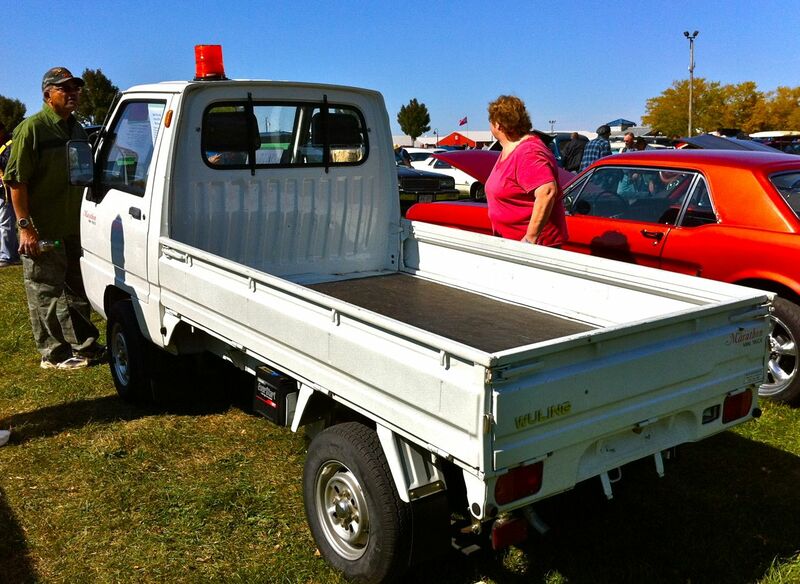 For sale in the car corral today was this gem: A Wuling single cab pickup truck. Wuling manufactures a variety of small commercial trucks in China in partnership with GM and SAIC. This model is advertised on the Wuling Web site as having a 1672 pound curb weight and 1232 pound load capacity. Its 970cc 4-cylinder engine can propel the vehicle to a blistering 60mph top speed. Wuling also brags up the truck’s “double circuit hydraulic brake system” (how very modern) and that “seat belt, rear view mirror and energy absorption bumper are equipped for increased safety”. Yes, those sides drop down for ease of loading. It might surprise you to learn that Chinese truck manufacturers have already established a beachhead here the U.S. of A. but here’s the proof. This vehicle does not, of course, begin to meet Federal safety or emissions regulations but as long as you don’t drive it on public roads it doesn’t have to. Why would you buy it, then? Well, it might be useful for running parts around a large factory complex, a construction yard or even a farming operation. 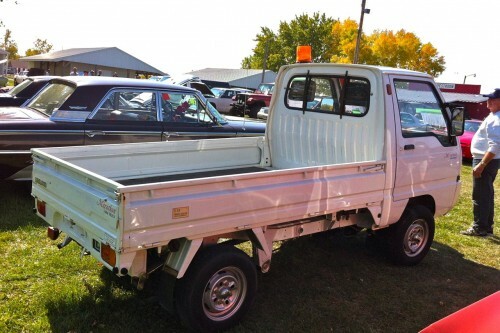 The seller makes it clear that it is for off-road use only and is sold with a bill of sale, no title. This same vehicle was for sale on ebay not long ago but apparently didn’t sell. Asking price now is a paltry $4995 but then, it’s a paltry little truck. Show-goers didn’t quite know what to make of the Wuling. This entry was posted in Car Shows, Marty Densch, Used Cars, Wuling. Bookmark the permalink.